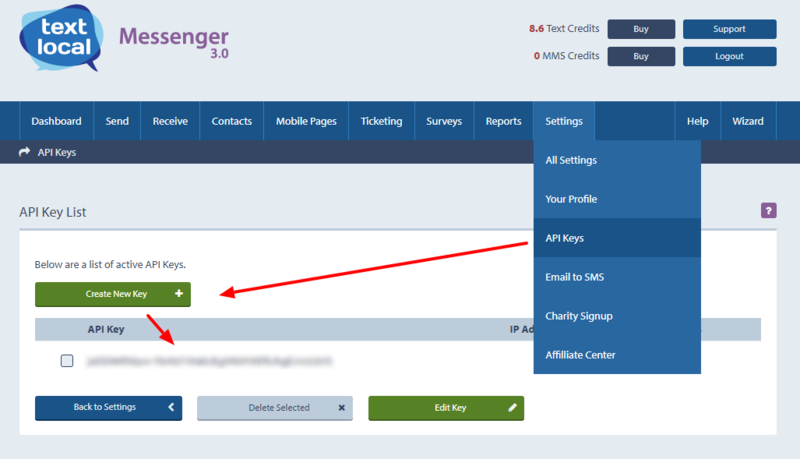 How to integrate Textlocal service with booking software? Textlocal integration allows to send SMS directly from the booking software (notifications). To make the integration, please follow the steps below. Register or use an existing Textlocal account. Login and navigate to your Settings -> API Keys tab. Create new key and copy it in to the software Admin -> Integration -> Textlocal, update API key, activate this service and save all changes. Please see attached screenshots below for more details. Note: If you see a message “Invalid login details” when sending SMS, to solve this problem please login to your Textlocal account and remove IP restriction for the API key. Also please make sure the API key entered in config tab is the same as displayed in your Textlocal control panel.